Fixer by Gene Doucette is an edge-of-your-seat thriller that combines sci-fi, horror, and romance. The story follows Doucette’s unconventional superhero as he wrestles with the consequences of his ability to see into the future. With great power comes great responsibility, or so goes the old adage. For Corrigan Bain, the leading man of best-selling novelist Gene Doucette’s latest offering, Fixer (The Writer’s Coffee Shop Publishing House), this sentiment only scratches the surface. Blessed (or perhaps cursed) with the ability to see roughly five seconds into the future, Corrigan can’t “fix” everything bad before it happens—though he has spent his life trying to. But with an otherworldly serial killer on the loose, a former lover who happens to be an FBI agent knocking down his door, and an increasingly troubled psyche, Corrigan’s “gift”—and his insistence upon protecting it from prying eyes—is being put to the test. Now, Corrigan must face long-standing horrors, confront the possibility that he may be going mad, and find a killer that no one can see. A skillful and arresting amalgam of sci-fi, horror, mystery, and romance that early reviewers are heralding as a “must-read,” Fixer defies the traditional conventions of genre fare. Prepare to second-guess everything you thought you knew about superheroes—and your own (mis)conceptions about what it would be like to see the future before it unfolds. Past, present, and future: how much of who we are is decided by who we have been and who we might become? “Superheroism” and the troubling consequences that come alongside it. Objective morality as a loaded gun. The surprising, funny, macabre perils of knowing what the future holds. Gene Doucette is an award-winning screenwriter, novelist, playwright, humorist, essayist, father, husband, cyclist, dog owner—and a few other things, too. He is, in other words, a writer. A graduate of Boston College, he lives in Cambridge, MA with his family. The books in his critically acclaimed Immortal series—which follows a sarcastic, alcoholic, sixty-thousand-year-old man named Adam—are his publisher’s top sellers and have spent months at a time respectively on Amazon bestseller lists. The third installment in the Immortal series—which is, as of yet, untitled—is expected for release in 2014. Fixer will be available for purchase in both paperback and e-book formats on March 21, 2013. It is currently available for pre-order via The Writer’s Coffee Shop Publishing House. 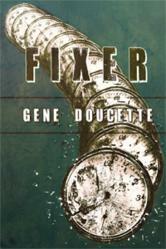 Check out the first two chapters of Fixer by Gene Doucette.